Our exclusive and adorable cube vase features everything babies love: bright colors, cute animals and a healthy dose of whimsy. 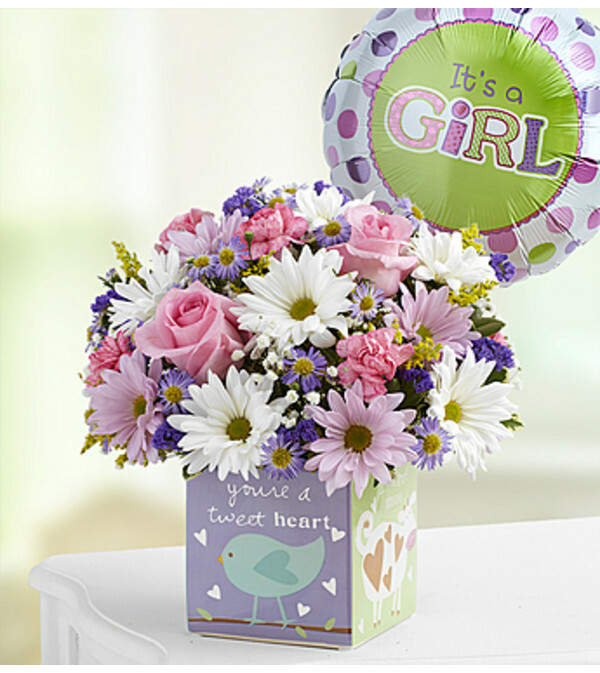 Inside is a bright and cheery mix of pink roses and carnations, white and lavender daisies and much more to congratulate the proud parents on the arrival of their new giggling girl. Says the cube’s designer, Sandra Magsamen: “This fun and playful cube vase is reminiscent of a child’s building block, filled with messages to help your baby grow up to be all they can be.” The cube can later be reused to hold a variety of items: cookies, candy, cotton balls... or whatever Mom and Dad will need at hand on the changing table!